Virtually maintenance free. 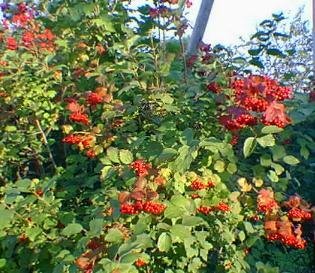 Dark green leaves, edible red berries. Who could ask for more. Grows to 10 feet high and 8 feet wide. 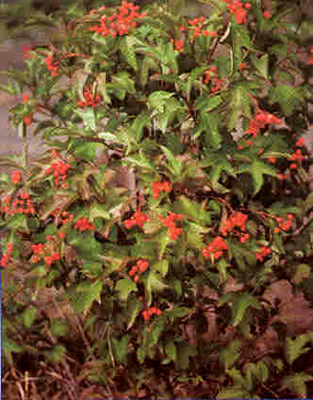 The Highbush Cranberry is a hardy, low maintenance shrub that is suitable for gardens or yards. Native to northern North America it ranges from British Columbia all the way east to Newfoundland. The dark green leaves that turn orange/red in the fall make this shrub a particularly attractive background to contrast lower growing lighter coloured shrubs. Although unrelated to the true cranberry (Vaccinium) the Highbush Cranberry produces edible fruit that is similar in size and taste. The cranberry juice can be used to make jellies or wines or simply left on the shrub to provide a tasty winter meal for our feathered friends. The Highbush Cranberry likes well drained sandy loam soil in locations that offer either full sun or partial shade.